As we grow as individuals in both our lives and our careers, networking will always be a beneficial and important step we can take to advance ourselves. We are told in school and in the early stages of our careers that networking events are beneficial for us, yet many still do not attend. Many students are even offered opportunities to attend events, but often don’t understand the importance of it. Networking events are crucial for our careers and we should attend as many as we can, as it is an opportunity as business professionals to meet others in the industry and gain valuable relationships with them. 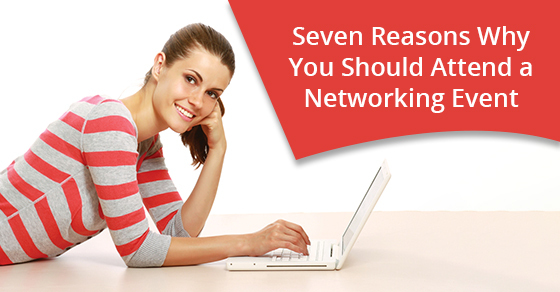 Here are seven reasons why you should attend a networking event. Building relationships is important to knowing others in your industry and can open up opportunities to greater paths. Networking events is when like-minded individuals are all together in an informal event. At these events, you can meet contacts and get to know others in your field where you can also benefit from their ideas and ways of thinking. These events make it easier to connect with others in comparison to the workplace. Networking is imperative in both the initial relationship building and the relationship maintaining stages. Sometimes all you need is a connection to growing your business and yourself as a person. In today’s society, everything is always moving at a fast pace, and it’s hard to keep up with current events and trends. During networking events, it’s inevitable that you will start talking about what has been happening currently in the world. This provides a great opportunity to hear what trends are occurring, and what areas in which others have been focusing on. If you are looking to grow your business, knowing and understanding what trends your target market is focused on will benefit you as well. In some networking events, there is usually a highly rated guest speaker who shares their experiences and difficulties they have overcome. Hearing the ideas of those who have been successful in their careers and life is a great opportunity to learn. If you treat the event as a learning opportunity, you will find them to be very beneficial and you may have new ideas yourself. Networking events give you the opportunity to connect with key influencers. It’s not everyday that you get this chance to chat with them, so make sure you take advantage of it. Networking events provide the proper environment to approach influencers and leaders in your field, as compared to seeing them on the street. It’s a great time and place to spark a discussion and tell them a little bit about yourself. Sometimes it can be easy to lose motivation or lose track of what we’re doing and we need a little push. Many networking events will give you new ideas and inspiration, which we need to grow our businesses. When we are motivated, it can lead to further success. We are pushed to wondering what else we can be doing to improve ourselves and our businesses, and being placed in a room with fellow high achievers can help with that. If you’re not interested in building relationships, then attend a networking event simply as an opportunity to be motivated by others. Sometimes working too much can be stressful, especially in an office setting. By attending a networking event, you can boost your career and build connections, meaning you are still working in some way. However, it’s also a time to let go a little bit while connecting with others. Take some time out of your busy work day to go to a networking event and take a break from all the paperwork. If you are in a role where recruitment is an essential component, networking events are a great way to look for new employees. Generally, the attendees who go to networking events are looking for new opportunities and are eager to learn from others. Meeting face to face outside of an interview session is a great way to gain understanding of a person and how they are. Based on your judgements, you can decide whether you want to proceed with a formal interview. If you are looking to plan your own event, it is essential to have the proper venue. Chateau Le Jardin is a perfect venue for conferences and networking events. It has a beautifully appointed function space that is guaranteed to leave your guests with a memorable and enjoyable experience. For more information on the venue, call Le Jardin at 1-888-529-8573 or contact us here.